NOTE: The code samples below are merely a proof of concept. This solution is not actively in place in any production environmetn that I am involved with. I was talking to a fellow ColdFusion developer about a web site he was working on, specifically a registration form, and what were some of the best practices with form length and such that would facilitate users filling out the form and submitting. This is a common issue with web sites that will not be going away anytime soon. In fact the questions he had are the same ones I have seen in dozens of blog posts trying to figure this out. How many questions to put on a form? What type of questions work the best? What question(s) scared off a user and kept them from completing the form? I know that there are a few “Form Abandonment” plug-ins out there for Omniture and the likes, but from what I’ve seen the data you get is somewhat limited. If your form has 20 elements on it and the plug-in only lets you know what the last element with focus was, you have to really think about the validity of that data. How do you know for sure that the user filled out the elements in order? Did the developer of the form set the tab index correctly? Did the user glance at the form, click somewhere near the bottom and then bail? Did the user fill out half the form the shut down the browser? From my understanding of the tools out there today, you are not able to get accurate answers to the questions above. However, this is an very interesting problem that got me thinking on how I could leverage ColdFusion to be able to capture and get more meaningful data from the abandoned forms. This jQuery function simply binds an onChange event to every form on the page it finds with the id: Form2BeTracked. This is an easy to deploy script site wide and has no impact on the normal form behavior. Form data is saved real time in the client scope. The nice part about this is that by default, ColdFusion saves the list of form elements in the form.fieldnames variable. Using that we can get a count of the number of variables for this form, and then see that only 2 of the fields were filled out and what the values of those fields are. All of this without the user clicking submit. If the user submits the form, we need to clear the data in the client variable. This is an easy one line of code to be added on the page that handles the normal submitting of the form. This will clear the form data out of the client variable. This is an important step that can not be skipped or your count of abandoned forms will be inflated. By saving the form data in the client scope it will be held there in the database for as long as the time frame defined in the ColdFusion Administrator. 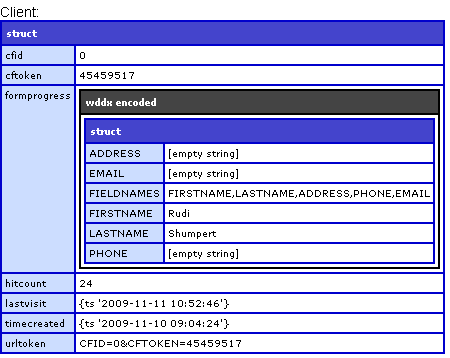 This setting will determine the frequency that you must check for abandoned form data. This should pull a result set with all the records of form data that has been saved. ie. abandoned. You end up with a variable string that you can then submit to Omniture using the Data Insertion API. See this post on details if the API. As you can see from the image above, you now have the count of the form elements in the form along with the data values from the form elements that were filled out before the user abandoned the form. With this, you can choose what format would be the most useful for your needs to really dig into abandoned forms. Next post Save the referrals!